Our scientists produce this peptide from a world-class laboratory. We provide USA-based shipping, customer services and technical support. We run a price match program to ensure a very competitive price. Contact us for COA, MSDS and Tech Data Sheet. Scroll down for product specification. 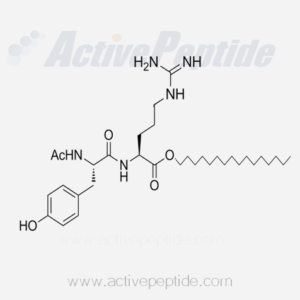 Request a Quote for Acetyl Dipeptide-1 Cetyl Ester to receive a prompt response and the best price from Active Peptide Company. Active Peptide Company provides a comprehensive offering of peptides and amino acids. Our business includes trading and shipping, custom synthesis, kilogram-production and quality assurance; Our 12,000 square foot lab in China is equipped with advanced technology and world class instruments; Our highly skilled scientists are committed to ensuring that the most appropriate techniques are selected for every project to achieve high quality and cost efficiency. Additional Information: Acetyl Dipeptide-1 Cetyl Ester is a product obtained by the coupling of the acetyl ester of tyrosine from Dipeptide-1 (q.v.) with the cetyl ester of arginine from dipeptide-1.